This piece of paper is 8 1/2" x 12 1/2", which seems an odd size now but which might have been a standard early in the 20th century. The paper is yellowed with age but was probably white or off-white originally. It feels about 20# in weight but not of great quality. There is no watermark. The sheet was folded somewhat in thirds and then had one additional fold about an inch in depth. The images above are of the two sides of the page. 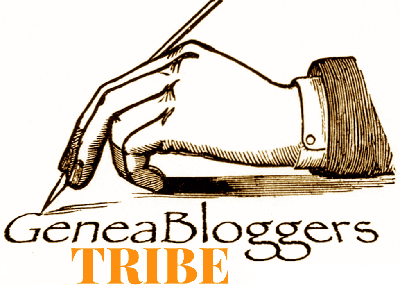 The main body of text is typed. The reverse has three handwritten words. This appears to be a transcription of a document. 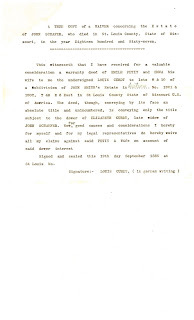 The location of the original document is not noted, but it might have been something that was held by the family. 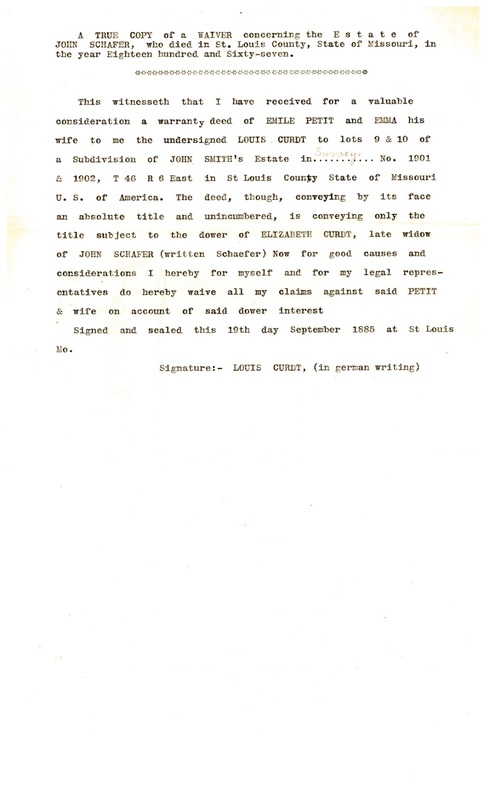 It's possible that it was filed with the county clerk in St. Louis County, Missouri. 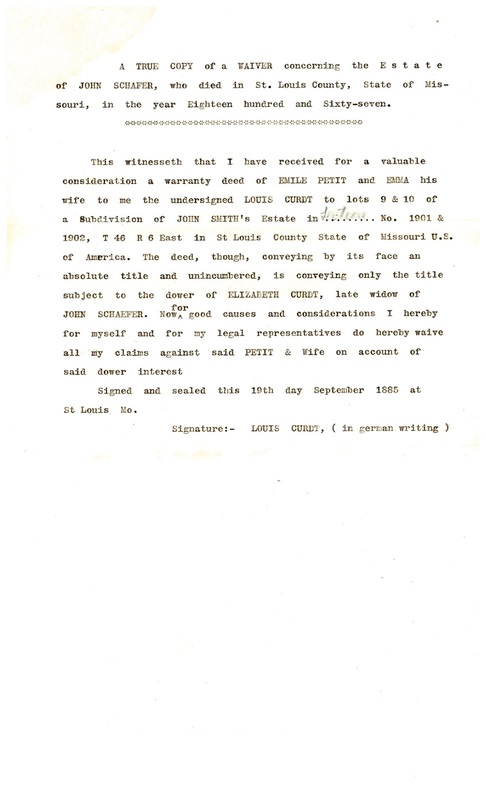 The transcription states that Louis Curdt paid a "valuable consideration" for a deed from Emile and Emma (Schafer) Petit but does not give the amount. If it were filed with the county, I would expect the amount to be listed. The focus in this is really the statement that Elizabeth Curdt's dower is being conveyed. 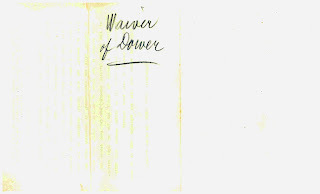 The words "Waiver of Dower" on the reverse of the page remind me of Jean La Forêt's handwriting. The first of these two documents is also 8 1/2" x 12 1/2". The paper appears similar in color and in weight to that in the first document described above. This page also has no watermark. The sheet was also folded somewhat in thirds and then had one additional fold about an inch in depth. Unlike the first document, no handwriting appears on the back. 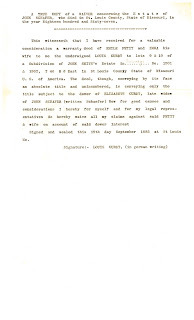 The second document is on a standard 8 1/2" x 11" piece of paper. This sheet is grayer in color than the other two. It was folded in thirds. It's about 20# in weight, but this has a watermark: DEPOSIT BOND. It also has no handwriting. Both of these are typed. The text is almost exactly the same as that on the first document. One difference is that the first and second have a long intro paragraph explaining that the typing is a true copy of a waiver, whereas the third document has only the word "COPY" at the top. The other significant difference is the term used to describe the parts of John Smith's estate being conveyed. 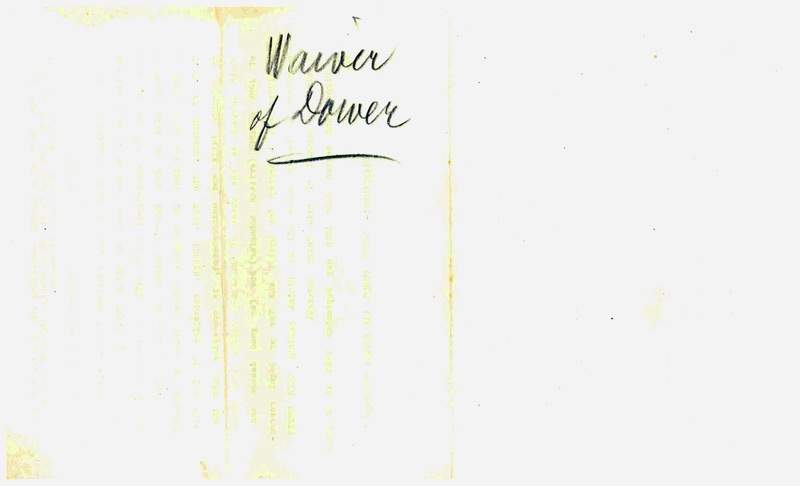 The first document has "Surveys", the second "Sections", and the third "Seys." The rest of the description of the property is the same. Other differences are minor, such as a period being dropped. I'm not sure, but I think this waiver is related to Emile Petit's visit to the United States in 1885. 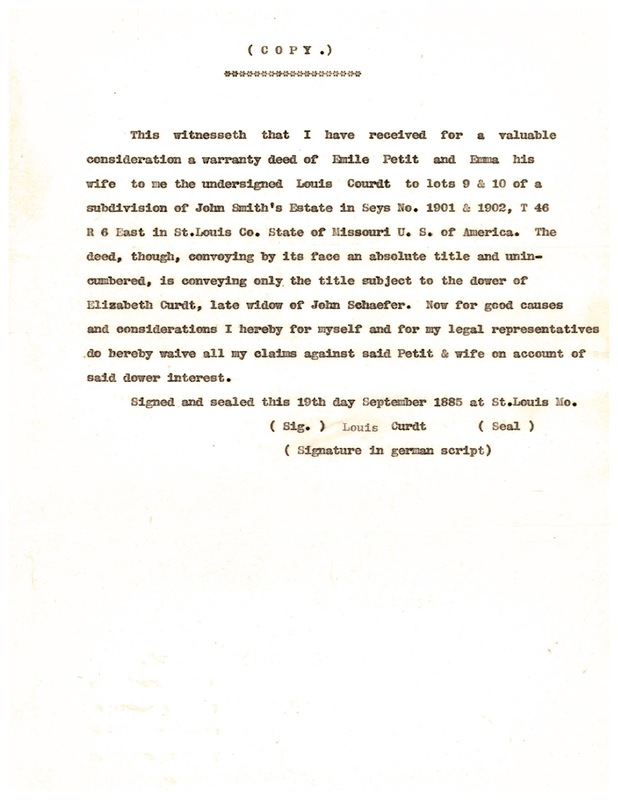 In the first part of her handwritten narrative, Emma wrote that Emile left Lorraine for Missouri on June 10, 1885. She didn't state when he returned but did mention that he brought $3,000 with him. She also wrote that she signed a document which she did not know the purpose of. It seems to me that Emma and Emile each having signed a document could have created the conveyance of dower which Curdt acknowledged. 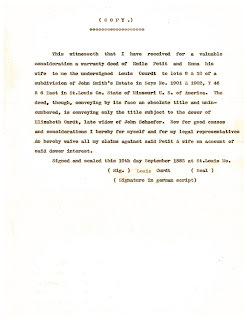 If that is the case, then these three copies of the waiver were probably part of the research that Jean La Forêt conducted while investigating what happened to Emma's inheritance. Wasn't it nice of Louis Curdt to waive his claims against Emile and Emma, now that he'd apparently gotten control of the land. I don't understand the reference to John Smith's estate. Why is it John Smith and not John Schaefer? This is the envelope in which the three copies of the waiver were found by me. It is 9 1/2" x 4 1/8". As the image shows, it is yellowish and darker around the edges. It's fairly sturdy, heavier than 20# in weight. Considering the fancy "f" in "of" and the flourishes and underlines, I suspect this might be Jean La Forêt's printing.